This week I'll be answering #3: Tell us what you’re reading right now — what you think of it, so far; why you chose it; what you are (or, aren’t) enjoying it. 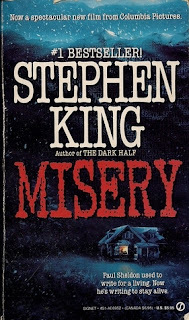 I started reading Misery by Stephen King on the plane from Baltimore to Phoenix and was totally engrossed for the entire 5+ hours we were in the air. I'm about half-way through the book and will probably finish the second half when I fly back to Baltimore. I actually chose this book because I have it in paperback and I prefer to read paperback on airplanes. Plus, I've seen the movie and have been wanting to read the book for quite a while now. 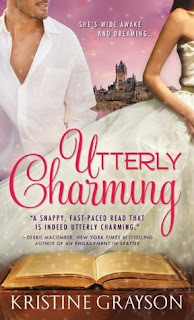 I believe the book is even better, but I still loved the movie! The second book I'm reading is on my Android. I started reading Utterly Charming (Fates #1) by Kristine Grayson just before I went on vacation as I was looking for something light-hearted and romantic to read. It's been great so far but I'm only about 30% into it. I'll probably finish it while I'm on vacation. Do you have a Musing Monday post to share? Leave me a link below and I'll be glad to stop by and take a look! And if you don't have one to share, what book are you currently reading? Are you enjoying it? Misery is fabulous. I couldn't put it down when I started reading it. Oddly, I have. 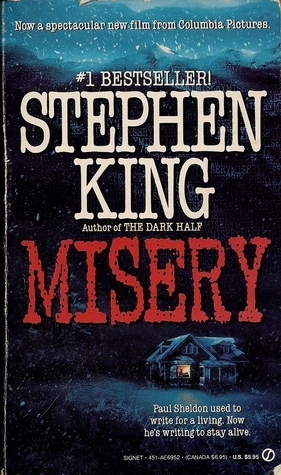 Never read anything by Stephan King....I must change that.